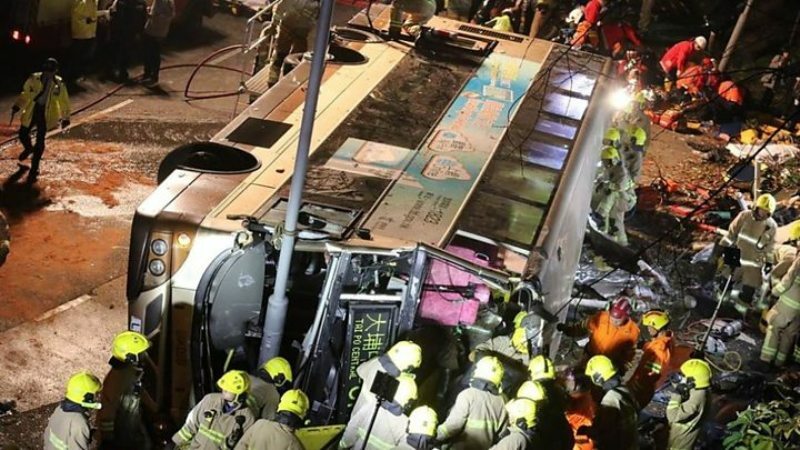 Dhaka, 11 Feb, Abnews: A double-decker bus has crashed in Hong Kong killing 18 people and injuring nearly 50, officials say. The bus was carrying spectators and workers from horse races when it overturned in the New Territories area. Some passengers managed to climb out of the vehicle but others had to be cut free by firefighters. Reports suggest the bus was going too fast. Police have arrested the driver and charged him with causing death by dangerous driving. Hong Kong’s public transport is usually safe, and fatal accidents on this scale are relatively infrequent. The driver had a good record and knew the route, which only runs on race days, representatives from the bus operator said. Hong Kong’s chief executive, Carrie Lam, said she was “deeply saddened” after visiting one of the 12 hospitals that were treating the injured. She told reporters that an independent investigation led by a judge would be carried out. Three women and 15 men were confirmed dead at the scene, the South China Morning Post reports, and 10 of the injured were in a critical condition. Earlier reports said 19 people had been killed. Saturday’s accident appears to be the worst since July 2003, when a double-decker fell off an elevated road after being hit by a lorry, killing 21 people.